A culture, like a human heart, can be broken with breathtaking speed. But both can take a long time to mend. Some never heal completely. After all, a culture is language, spirituality, history, tradition, food, and physical home. Diane Glancy’s novel, Pushing the Bear, recounts the forced removal between September, 1838 to February of 1839 of Cherokees in North Carolina and Georgia from their communities to Indian Country in Oklahoma. The U.S. government uprooted people who had been productive and stable farmers. 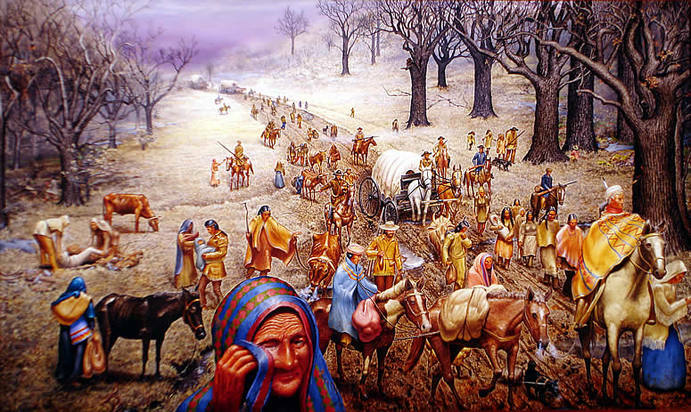 Armed soldiers forced the Cherokee to walk more than 900 miles through rough country and winter conditions. Many died of exposure and despair. Glancy tells her story via several characters making the trek. Maritole, a wife, mother, daughter, and aunt, describes her experience as Pushing the Bear, a Cherokee expression for doing the impossible. she and her angry, disillusioned husband, experience the upending of traditional gender roles, family, the means of survival itself during the horrors of the trail. When one of the soldiers begins to bond with Maritole and show some kindness, he is reassigned. The basket weaver is a storyteller who sees the need to regroup the disintegrating community through oral history, making new stories to keep the Cherokee cohesive. In the end, Glancy’s story is a tribute to those who managed to survive and keep their cultural cohesion while having to adapt to a harsher world. I taught this novel to Lakota Sioux teenagers some years ago. Its not an easy read, but the kids got it. Indigenous populations understand what it means to be deprived of human rights and what it means to survive and reclaim them. Books like Pushing the Bear help to clarify this for us all. This entry was tagged Cherokee, Diane Glancy, Human Rights, Pushing the Bear. Bookmark the permalink. Timely and important post. Unfortunately, our government is still willing to destroy the culture and heritage of American Indians. In the recently passed Budget bill, Congress gave away a large part of the ancestral and sacred homeland of the San Carlos Apache Tribe to a foreign mining company. Greed wins again.